Freetown is a city squeezing itself into the small space between the mountains and the sea, in a country with the highest annual rainfall in Africa. 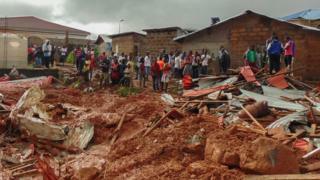 In August - the height of the rainy season - an average of 539.9mm falls on Sierra Leone's capital. So it comes as no surprise that Freetown is a city used to flooding. But Monday's rain brought with it a disaster which left hundreds dead, and will no doubt be followed by finger-pointing and blame shifting. Was it simply the effects of climate change and geography, or something more avoidable? "Yes, the floods and mudslide were caused by nature. 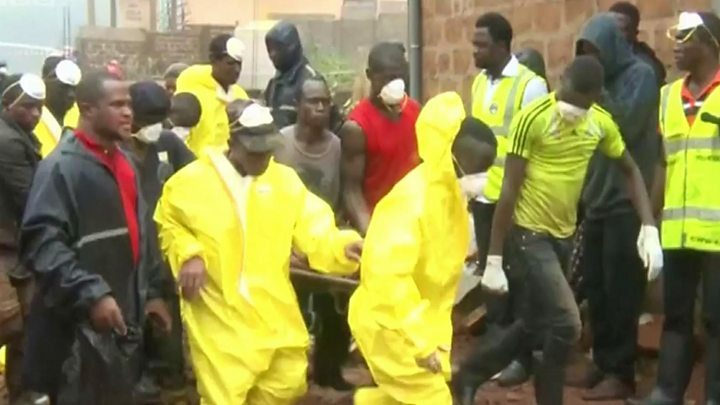 But they could have been avoided or at least mitigated," the BBC's Umaru Fofana wrote on his Facebook page. "If we hurt the environment, the environment will fight back. If we fail to plan, we plan to fail. It's that simple." Freetown was first established in the late 1700s, a home for freed slaves from the US and UK. Its position was chosen not for what was on land, however, but what the sea could offer: the world's third largest natural harbour. As a result, Freetown ended up in an area of heavily-forested mountains, which has not been accommodating for a growing population - currently around the million mark. "It is the highest density of people I have ever seen," said Olivia Acland, a freelance journalist based in Freetown. "The amount of people when you walk through the streets, and the traffic. There are just people everywhere." Many of those people live in the city's informal settlements, of which there are more than 60, according to Slum Dwellers International. Here, tiny tin homes packed with large families can be seen squeezed on the banks of rivers, the sides of mountains, on the edge of the sea. But, says Jamie Hitchen, of the Africa Research Institute, it is not just the city's poorest residents who are building their homes in areas which are contributing to the flooding risk. Some of the city's wealthier residents are also responsible for the deforestation destabilising the soil, tempted higher into the hills by the cooler air and impressive views of the Peninsula Forest area, near to where the mudslide occurred. "It is happening at both levels," Mr Hitchen said. "Unfortunately, the impact [of disasters] is on the poorer residents." The government is aware of the problem - and how it might increase as the effects of climate change begin to take hold. Two years ago, Mohamed Bah, deputy director of Sierra Leone's Environment Protection Agency (EPA), warned "irresponsible actions taken on the hills will affect the city greatly". "Until we stop dumping waste into drainages, until we stop clearing the trees, we will always face severe consequences of climate change," he told Sierra Leone's Standard Times Newspaper. And yet, Mr Hitchen feels there is a lack of political will to deal with the issue head on. "The ideas have been put forward, the failure has been in terms of political action," he said. Mr Hitchen added: "There is technically a moratorium on building in the area of the Peninsula Forest. That is there in writing, but not in any kind of enforcement." Abdulai Baraytay, a spokesperson for Sierra Leone's president, told the BBC's Newsday programme the EPA had spoken to residents about the danger two weeks earlier, and tried to put some trees in - but said they had been chased away. Mr Baraytay also pointed to earlier attempts to move people out of harm's way. After the last major flooding in 2015, Sierra Leone's government did make an effort to move people living in one settlement to somewhere safer and more spacious on the outskirts of the city. "But they rented [the homes] out and came back to the slum," he said. Mr Hitchen had a different view on why they returned: to find work. "They provided houses, but they did not connect them to the grid - they did not connect them to jobs," Mr Hitchen said. There is another problem contributing to the flooding: the rubbish blocking the drains. "There is no clearing of waste, the drains fill up. Everyone is saying it's not our responsibility," Mr Hitchen said. "But even if they addressed the issue of waste collection, there is nowhere for it to go. Both Freetown's dump sites should have been closed in 2009." But despite the unique challenges of Freetown. this is not just a problem in Sierra Leone. The 2009 Unjust Water report found examples of worsening floods in Ghana, Uganda, Mozambique and Kenya. It was generally, the report concluded, caused by "the growing occupation of floodplains, increased runoff from hard surfaces, inadequate waste management and silted up drainage" - all factors said to contribute to the problem in Freetown. Professor Ian Douglas, co-author of the report and University of Manchester professor, told the BBC: "You have several related problems about vulnerability relating to informal settlements. "Two, urban development up stream increases the rate at which the water rushes down in to the flood plain, exacerbating the danger by excavating in to hillsides. "Three, encroachment on the flood plan by municipal works and major developments leads to the waters being left with narrow spaces to flow through, therefore flowing more quickly and with more energy to pick up debris." When it comes to flooding then. climate change is simply another contributing factor.